Quick and easy. With a food processor – took maybe 15 mins to make. Refreshing and delicious. Perfect for summer. No cooking required. I’m thinking about making this the summer of gazpacho- so if you have any favorite recipes- send along. This one is from Ina, the Barefoot Contessa. I was a little put off by the tomato juice- because it’s not something I drink usually- but think of it more like cold tomato broth. 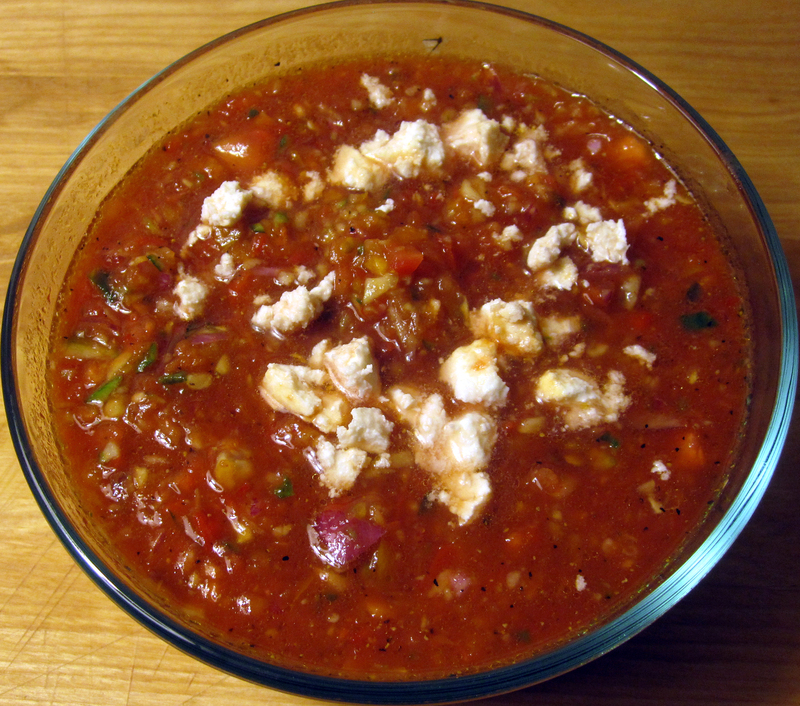 I topped mine w. a bit of ricotta salata… feta or goat would also work nicely. Keep the vegs separated- chopping cucumbers, peppers, tomatoes, jalapeno, red onions into 1-inch pieces. Put each vegetable separately into a food processor fitted with a steel blade and pulse until it is coarsely chopped (each breaks down at different rates). Do not overprocess!